The precision of a digital dive computer may not be enough for very high precision survey tasks underwater. Dive computers usually report depth to 100mm but in practice the precision may be twice that value. On flat wreck sites DSM tape measurements do not provide much depth information so the limitations of the dive computer measurements may be noticed. Although high precision digital depth recorders are available they are expensive so one alternative is to construct a bubble level. The bubble level is usually thought of as ancient technology; it uses a bubble of air to accurately transfer a known level from one point on the wreck site to other points on the site. Height measurements to points on ships structure can then be made from a common level. For the Stella 1 survey a bubble level was constructed using materials at hand and available at a local builders merchant. 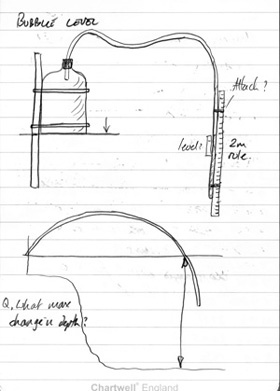 A 7m length of 10mm diameter clear plastic tube used for wine making was used to contain the bubble then the top cut from a plastic drink bottle was attached to the hose at the fixed or reservoir end. With the wide, open end of the reservoir pointing downwards the hose could be filled underwater with air from a diver’s regulator. 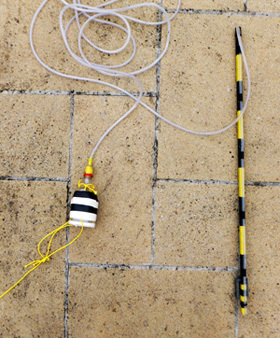 The free end of the plastic hose was attached to a 1m long aluminium scale bar and weighted with a small lead weight so the free end would fall to the seabed if dropped and not let the air in the tube escape. In use the fixed, reservoir end of the bubble level was attached to the shallowest control point so all measurements were made below this level. The plastic tube was filled completely full of air and floated in a big loop above the site. The difference in height was noted between the control point reference and the lower level of the air bubble at the fixed end of the tube. 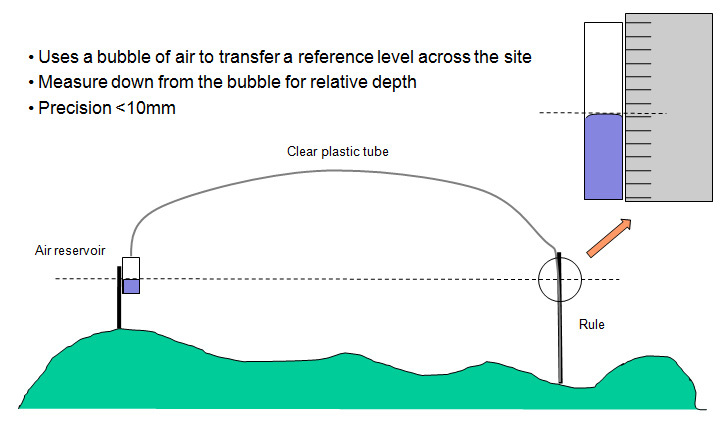 The free end of the tube was then moved around the site by a pair of divers and for each control and detail point the relative height of the bubble above the point was measured with a 1m plastic rule to a resolution of 1mm.